In a town that in the 1950s served as an immigrant transit camp for Jewish Yemenites, members gathered in an elaborately decorated venue outfit to echo traditional life in Yemen, complete with a fake well and photographs of the new Yemeni immigrants in Israel. The town was over 1,000 miles from Yemen’s capital city of Sana’a, which influenced the most striking look of the night: a tall cone-shaped headpiece, the tashbuk, traditionally made of pearls and flowers, accessorized with silver and gold jewelry. At a recent henna celebration at the Yemeni Heritage Center in Rosh Ha’Ayin, Israel, the bride had three ensemble changes, each representing a city or region in Yemen. Although both the bride and groom were raised in Israel, honoring their Yemeni heritage was something important to them. The henna ceremony, a pre-wedding event which has been a tradition in Asian, North African and Middle Eastern cultures, where women paint designs, or in this case place dye onto the skin of the bride and her guests, was held about a week before the wedding. In Yemen, the henna dye was believed to symbolize fertility; the deeper the color of the dye, the better it was for the woman. In some cases, they would apply it for days. The tradition of henna ceremonies was popular in Yemeni society, with Jews and Muslims sharing a common custom. In 1949, Jews from all over Yemen were airlifted to Israel in a yearlong effort known as Operation Magic Carpet. (Smaller numbers came earlier, pre-state, from the end of the 19th century, and in subsequent migrations.) Many tried to bring traditional bridal garments and jewelry, but because of their heavy weight, the majority of the items were left behind. During early years after the founding of the state, Jews emigrated from over 80 countries and from several ethnic groups, forging a new Israeli identity that was often favored over the languages and other aspects of diaspora identities. Mizrahi Jews from North African and Middle Eastern countries were often looked down upon by the Ashkenazi establishment and pressured to leave their diaspora culture behind, and thus, henna ceremonies became smaller and more discreet among the Jewish Yemenite community. That changed somewhat in 1965 when the Israel Museum in Jerusalem featured an exhibit of a Jewish bride from Sana’a, Yemen. Showcasing the garment was significant because it honored a part of the diaspora culture. But it wasn’t until the late 1970s, as a result of a political shift in Israel, that people started talking about ethnic pride in Israel. 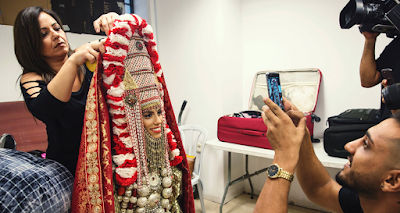 Dr. Carmella Abdar, a professor in Folk Culture at the Hebrew University in Jerusalem and Achva Academic College, said that in contemporary Israel, the headpiece is made in advance for the bride. But traditionally in Yemen, artisans would assemble the headpiece by hand on the bride herself, who couldn’t move for hours.